National Fish & Chip Day is about giving fish and chips the recognition it deserves and helping to secure its position as the nation’s favourite dish. In anticipation, here are some of our ‘Simply’ scrummy menu ideas to help you celebrate fish and chips with our own particular twist!! Wild MSC Alaska pollock fillet goujons coated in our unique vinegar infused crispy tempura batter. These tasty little morsels are great served with chunky hand cut, oven baked chips and garden fresh peas. For food on the go, try popping the vinegar infused goujons in a whole meal bap with crispy lettuce, tomato and mayo. Wild MSC Alaska pollock fillets coated in our unique vinegar infused crispy tempura batter. 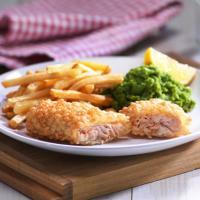 For a yummy twist on traditional fish and chips serve with potato and cabbage mash and some crushed peas. Alternatively, fancy a quick snack? Why not try slicing the ‘vinegar infused fillet’, adding to a fresh tortilla wrap along with lettuce, cucumber and tomato with a dollop of tartare sauce or mayonnaise? 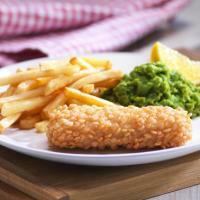 Wild MSC Alaska pollock coated in a unique, crispy & crunchy GLUTEN FREE coating. The original and the best, with the light bubbly crunch coating, this is perfect for intolerances or can also be served as an inclusive meal for everyone. We recommend serving these with homemade sweet potato fries, peas, sweetcorn and a spoonful of your favourite sauce. 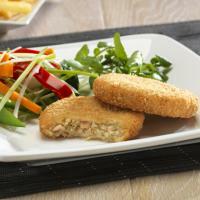 Wild Alaska Salmon Fillet coated in a unique, crispy & crunchy GLUTEN FREE coating. We love these super crunchy and extremely flavorsome fillets served with home-made thin cut potato fries and fresh veggies. They make a really healthy and delicious meal. In a hurry or feeling peckish? 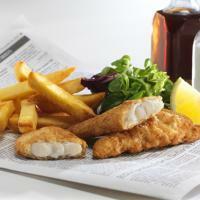 Serve in a gluten free bread roll as a great ‘grab & go’ fish fillet sandwich. Wild Alaska salmon mixed with sweet potato, onion and herb coated in a crispy tempura batter. The tantilising mix of flavours make this a favourite with all ages and an interesting alternative to traditional fishcakes. Why not try serving these with homemade potato wedges and crispy fresh salad, adding a dollop of your favorite sauce. For a quick and easy snack, slice the fishcake and wrap in a whole meal tortilla together with, lettuce, tomato, cucumber and a dash of tartare sauce. Wild MSC Pollock coated in a unique, GLUTEN FREE coating. 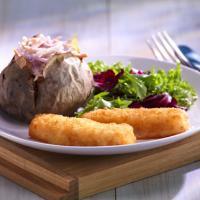 Simply serve the fishfingers with chips and gluten free beans for a particularly delicious alternative! Do you want an idea for a quick snack? 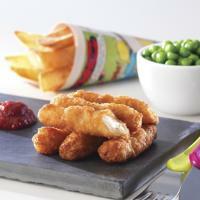 Why not wrap these yummy fish fingers in a gluten free tortilla with some fresh salad... simply moreish!